Can Watching Movies Replace General Anesthesia for Kids With Cancer? Kids with cancer often undergo much pain in their initial years of life. 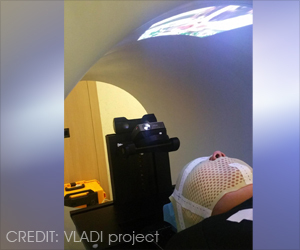 Radiotherapy that requires dozens of doses of general anesthesia could be replaced by projecting a video directly on to the inside of radiotherapy machine during the treatment, finds a new research presented at the ESTRO 36 conference. Although cancer is rare in children, worldwide there are approximately 215,000 new cases in the under 15s each year. Around a sixth of these children require treatment with radiotherapy, including those with brain tumors, and bone and soft tissue sarcomas such as Ewing sarcoma and rhabdomyosarcoma. Catia Aguas, a radiation therapist and dosimetrist at the Cliniques Universitaires Saint Luc, Brussels, Belgium, told the conference that using video instead of general anesthesia is less traumatic for children and their families, as well as making each treatment quicker and more cost effective. She explained: “Being treated with radiotherapy means coming in for a treatment every weekday for four to six weeks. The children need to remain motionless during treatment and, on the whole, that means a general anesthesia. That in turn means they have to keep their stomach empty for six hours before the treatment. The study included 12 children aged between one and a half and six years old who were treated with radiotherapy using a Tomotherapy® treatment unit at the university hospital. Six were treated before a video projector was installed in 2014 and six were treated after. Before the video was available, general anesthesia was needed for 83% of children’s treatments. Once the projector was installed, anesthesia was only needed in 33% of treatments. Aguas continued: “Radiotherapy can be very scary for children. It’s a huge room full of machines and strange noises, and the worst part is that they’re in the room alone during their treatment. Before their radiotherapy treatment, they have already been through a series of tests and treatments, some of them painful, so when they arrive for radiotherapy they don’t really feel very safe or confident. “Since we started using videos, children are a lot less anxious. Now they know that they’re going to watch a movie of their choice, they’re more relaxed and once the movie starts it’s as though they travel to another world. As well as avoiding some of the risks inherent to general anesthesia, the research also showed that treatments that used to take one hour or more, now take around 15 to 20 minutes. This is partly because of the time saved by not having to prepare and administer anesthesia, but also because the children who know they are going to watch videos are more cooperative. Aguas and her colleagues continue to study children who have been treated since the projector was installed and they are extending the project to include adult patients who are claustrophobic or anxious. President of ESTRO, Professor Yolande Lievens, head of the department of radiation oncology at Ghent University Hospital, Belgium, said: “The success of this project is good news for young patients, their families and their medical teams. Simply by installing a projector and showing videos, the team have reduced the need for anesthesia and reduced anxiety for these children.